Tuesday nights are popular at Divino Wine Studio, in the heart of Ottawa's Little Italy quarter. For $35, you get to nosh on three courses under a regional theme. This past Tuesday - the last one of summer, sadly - I joined Holly, Eva and Nita, and their friends Jane and Jackie for Tasty Tuesday virtual trip through the Italian region of Basilicata. Basilicata is a small region in the south of Italy bordered by Campania to the east, Puglia to the north and east, and Calabria to the west. Its main grape, Aglianico del Vulture, grows in the soils of an extinct volcano, imparting all sorts of rich characteristics to the fruit. Food-wise, Basilicata focuses on simplicity and practicality: basic cuts of meat and straightforward vegetables in recipes where nothing is wasted - a necessity in an area historically plagued by poverty and a lack of natural resources. Tonight's $35 table d'hôte reflected that rustic style in each dish, from the flaky calzone stuffed with ricotta, tomato, onions, fresh basil and capers; to pillowy-soft coils of broccoli-infused cavatelli featuring salty strips of guanciale, southern Italy's version of proscuitto; and finally, to the biggest lamb shank I've ever seen on one plate, almost dripping off the bone in its doneness, and reminiscent of my grandma's cacciatore. Naturally, a dinner out with a bunch of wineaux has to include wine. It was funny to watch everyone pulling out either a notebook, an iPhone or a camera (or sometimes all of the above) as the wine was poured. It got a little crowded, with our electronic gadgetry competing for space with the glassware on the table. We must have been a sight, twirling our glasses and sticking our noses deep into the bowls almost in unison. Sommeliers. Pffft. Tenuta Cocci Grifon 2009 Le Torri Falerio - Hailing from the Marche region, this one's a blend of pecorino, passerina and trebbiano. Reminiscent of grassy fields and flint, with loads of citrus and sharp, zippy acidity. Crisp and tart on the finish. Once again, odd aromas emerged from the glass after sitting for a bit: deep-fried carnival donuts. 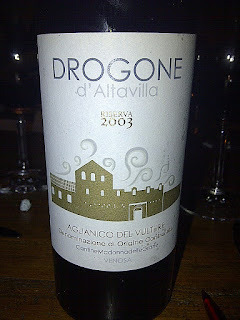 We learned a nifty trick of the trade from our sommelier, Eric, as he decanted an Aglianico to go with the secondo. Pouring in a smidgen of the wine you're decanting will remove dust and stale water, which could affect the taste of the wine. Also, turning the decanter as you pour in the wine allows for maximum aeration. 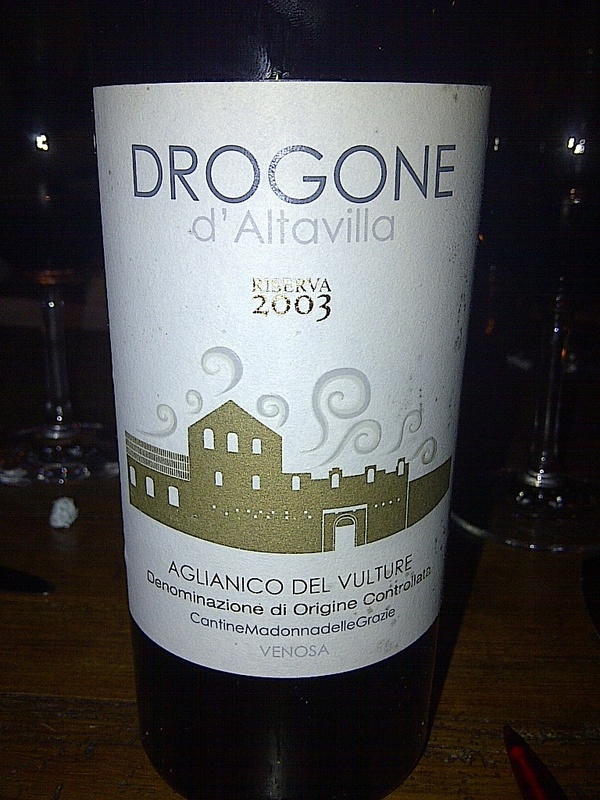 Cantine Madonna della Grazie 2003 Drogone d'Altavilla Aglianico del Vulture - Stewed red fruit, raisins, roasted tomatoes, smoked meat and cherry on the nose, followed by hints of cola and green pepper, with a firm balance of acid and tannins. This was a killer wine; we all took turns gushing over it and thanked Eric for digging it up. Did we want dessert? Maybe if I had any room left after that feast. 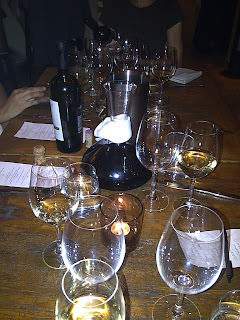 Sated, we thanked Antonio, Eric and the rest of the Divino staff for an excellent evening. Preston's newly restored storefront beauty shone with Mediterranean charm as we strolled along home, whispering of many more decadent evenings to come.